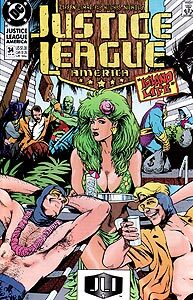 Cover Description: In the foreground, Booster Gold and Blue Beetle relax while Fire serves them drinks. In the background left, Batman and Martian Manhunter restrain an enraged Maxwell Lord. In the background right, Big Sir and Major Disaster whisper to one another while they sneak around with large sacks of money. 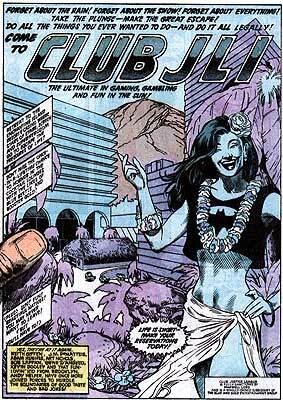 Brief Synopsis: Blue Beetle and Booster Gold open a JLI casino/resort on the island of KooeyKooeyKooey. Issue Notes: The events of this issue take place shortly (perhaps as soon as three days) following the events of Justice League America #33 and after the events of Time Masters #1 & #2. PRODUCT PLACEMENT: In a newspaper advertisement promoting his new venture with Blue Beetle, the tropical resort/casino Club JLI, Booster Gold is mentioned as entertainment in the cocktail lounge. The ad references Beetle and Booster's company, The Blue And Gold Entertainment Group. This is the first time that the pair has referred to themselves as "Blue and Gold." In order to finance the construction of their resort, Beetle and Booster have embezzled all of the funds from the Justice League International (with the plan to pay this unauthorized loan back once the resort has proven a success). Since the JLI is supported by the United Nations, this would qualify as an international crime against the world government, and may be settled in the U.N.'s International Court of Justice. No matter what time period he's in, Booster always ends up in trouble with the world over issues with money. Booster comments that Kilowog built the Club JLI in just three days. Since construction had not even begun on the resort at the conclusion to Justice League America #33, the events of this issue must take place at least three days later. The size of the operation, including advertising, staff, and number of guests would suggest that the club has been open considerably longer than that. A costumed Booster laments the heat on KooeyKooeyKooey. Because the success of Club JLI is tied to the guests' ability to hobnob with famous costumed superheroes, Booster feels he must wear his costume for promotional reasons. As one of the rare heroes with no secret identity, being forced to wear the costume is a unique situation for Booster. Major Disaster and Big Sir plan to win at cards in the Club JLI casino thanks to Big Sir's ability to count cards. This mirrors events in the movie Rain Man, winner of the 1989 Academy Award for Best Picture, in which two brothers attempt to win in a casino based on the autistic brother's ability to count cards. Like Dustin Hoffman's character in that film, Big Sir is of limited mental means. Though it is not explicitly stated (this is, after all, a mainstream comic book suitable for all ages), the game that Big Sir is playing is blackjack, one of the most popular casino games in the world. It is also the game portrayed in the movie Rain Man. The clocks behind the check-in counter at Club JLI reference the time in several major cities around the world. Two of the clocks shown are identified as the time in New York and London, both cities with JLI Embassies. The third clock appears to indicate Chicago, the hometown of the Blue Beetle. The bellboy, Maynard, is dressed in an inaccurate representation of Guy Gardner's uniform. Ironically, Gardner will later use the same gimmick of dressing up common employees in the guise of superheroes when he opens his own superhero themed attraction, the bar Warriors. 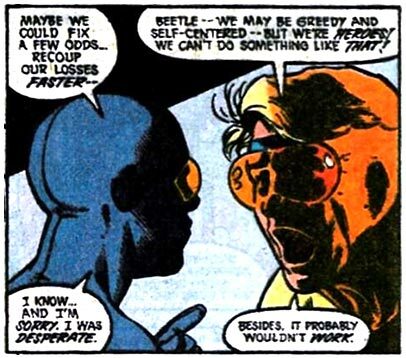 When Beetle suggests that Club JLI could fix a few games in order to make more money, Booster immediately vetoes the idea: "We may be greedy and self-centered - but we're heroes!" This again proves that there is a limit to what Booster will do in order to make a buck. Beetle and Booster are confronted by Aquaman. The pair previously met Aquaman during both the Millennium and Invasion! mini-series. FASHION ALERT: In this panel, Booster's costume shows a star on his back, in between his shoulder blades. This purely cosmetic alteration is the first change to his costume since the star on his chest became colored solid blue in Booster Gold, Vol. 1, #12 (January 1987). As recently as Justice League America #33 and Time Masters #1, this area on Booster's back was seen colored solid gold with no star present. In Justice League International #17, Beetle complained the Booster was always the one to catch beautiful, half-naked girls. It certainly appears that Booster has snagged another in this panel. Boosterrific Review: Worth owning for the cover alone, this issue features the memorably disastrous short operational life of Club JLI, doomed resort casino. A must read for any fan of Blue Beetle, Booster Gold, or super hero comic books. This issue is one of my favourites! I remember reading this issue when I was just a kid and I loved every page. The cover by Adam Hughes is one of the best in my opinion. It is totally unforgettable and gives a nice summary of what the story is about. Stories such as these really created the bond between Ted and Michael, which is why we feel such affection for these fictional characters. I cannot wait for this story to come out in the trades later this year.